Whether it is at work, home or a small party, watches are an integral part of grooming and life, at large. With the Maxima Digital Watch, epitomize trend and technology that suits your distinct taste. This Men's Digital watch from Maxima is sure to turn heads as you wrap it around your wrist at a casual weekend or an adventurous holiday with your friends. This exciting watch runs on Quartz Mechanism and delivers technology like never before. Body and Design The posh design and technology of this Maxima digital watch sets it apart from the rest. The well-crafted round dial gives the watch a simple yet tough look and feel. Designed with great ergonomics, the long-lasting bright leather strap of this Men's Digital Watch from Maxima provides perfect comfort to your hands. Cased in a sturdy bezel, the watch is well protected from minor falls and impacts. Adding to its durability and toughness, the watch features shock resistant technology that will leave you spellbound. 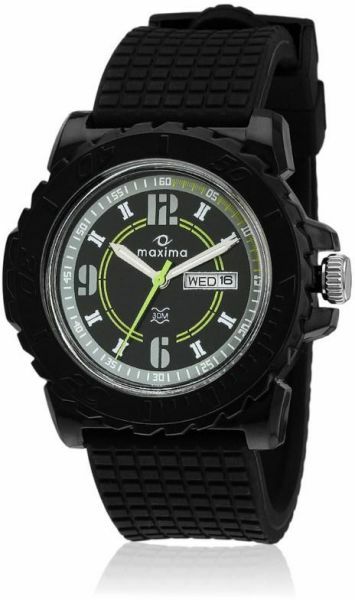 Functions and Other Features Have fun as you jump into the pool with this Maxima Digital Watch that is water resistant. The watch also has a date display feature that ensures that you do not forget important dates and keep track of time wherever you go. Be stylish and sporty with this affordable digital watch as you strap it around your wrist, combine it with your furrowed jeans and are off to adventure land.